Well that is it for now. A great time to be photographing. The Fall colors are still coming on. The weather is co-operating for the most part. Until next time happy trails. A short half hour canoe ride brings you to a stretch of fast water that has some interesting photo opportunities. The location is the Aux Sauble River North of Massey Ontario. This scene was interesting in that on the West side of the river was an unique rock structure. The face of the rock was smooth and dished from constant wear by water over countless years. There is a nice overhang of Pine branches on the far shoreline. I set up my tripod and my Canon 7D to use the rock structure on the right as my lead in to the composition. Well that is it for this week. Thanks for stopping by. Until next time happy trails. Paul Smith and I awoke to the sound of wind in the trees.Every once in a while the wind would buffet the tent.There would be no photographing this morning.It was Friday morning and we were to depart home. Dressing and crawling out of the tent,we were met by a wind that had shifted into the West during the night.After a leisure breakfast and a hot coffee,we packed our gear for the trip out.Paul and I had decided to try the shorter portage over to Killarney Lake.Pushing the canoe from shore we were able to go with the wind.The islands sort of sheltered us from the wind until we hit open water.The rollers were now going past us and there was some white-caps.The canoe was moving at a good clip and before long we were at the portage. Packing over was quick and before long we were on our way again.The bay here was calm.In a couple minutes we arrived at a small beaver dam that we hauled over and were on our way.The portage over to Freeland Lake was soon spotted and we arrived shortly there after.While loading our gear into the canoe,a kayak approached and Paul and I had a good chat with a gentleman from the French River area.He was day tripping over to Killarney Lake. Pushing off,we paddled into the wind now.The velocity was low-keyed here.Paddling steady we made good time to George Lake.As we approached the West end of Freeland Lake,four heads popped up beside us.They were a family of Otter checking us out to see who the intruders were.This was Paul and myself s first sighting of Otters.We had also observed Loons on the way out.The young were gray and almost adult size.The adult loons were just starting to change. At the final portage there were a number of folks carrying over to Freeland Lake.Talking to these folks I asked about the conditions on George Lake.I was told we had our work cut out for us.Paul had met a couple having lunch so I think we spent also an hour chatting to them.It was now time to find out what was in store for us. As we rounded the first point the full force of the wind hit us.The waves were high enough and at times there were rollers.Every once in a while there would be a strong gust of wind that stopped us in our tracks.With some hard stokes we finally made it into the bay to the landing.The Explorer was quickly loaded and we were on our way home.Another good trip in the books. 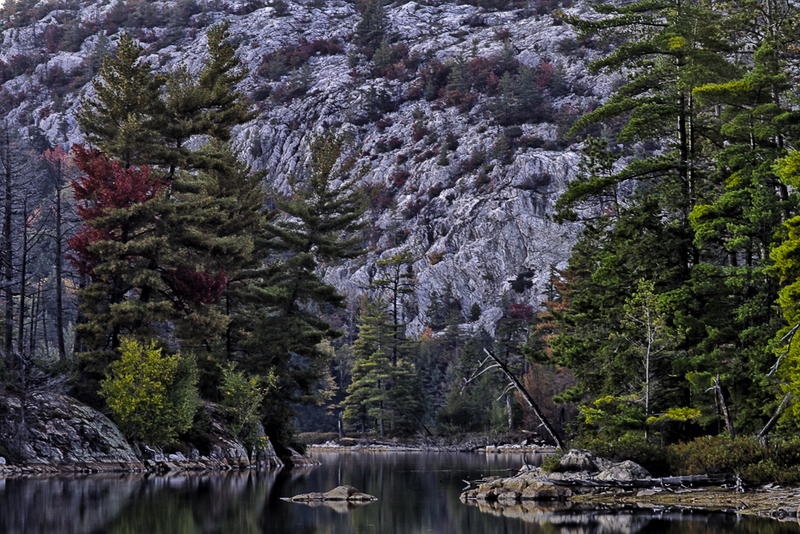 The composition above was taken Thursday night at the West end of O S A Lake.It was close to dark when I happened along.I was intruded by what I saw.There is just enough Fall color to tell the time of year.In the background is the flat rock surface of the La Cloche Mountains on the North side of O S A Lake.By utilizing the various points and islands I created a path for your eye to follow into the background.Thus this photo was created.The reflections were kept minimal.You can see scrub oak on the rock face.They are a reddish brown. While that is it until next week.It is now time to photograph Tamarack as they change colors.So until next time happy trails. What is Behind the Campsite. This past Friday myself,my daughter and son-in-law headed for Muriel Lake in Killarney Provincial Park.We had to cover 5 lakes and 4 portages to the campsite.We did not get away till 4:00 that afternoon.A quick check into the park office for camping permits and we were soon loading the canoe at the George Lake beach.We decided to eat a quick supper before we left.It turned out to be a very hot weekend. Launching the canoe we were off on our adventure.George Lake is about a 40 to 50 minute paddle to the first portage of 90 meters. Off loading our gear we quickly carried over to Freeland Lake and headed to the next portage.The wind was light so the going was easy.Freeland Lake has a fair amount of vegetation in the form of lily pads. The Killarney Lake portage soon arrived and we carried all our gear and canoe over.This was a 380 meter carry over.You could feel the heat.Once out into the open water the beauty of the La Cloche Mountain system is much evident.We had a short canoe paddle at the upper end of Killarney Lake to get to the carry over into O S A Lake.There are a lot of campers at this time of year and most folks are friendly. We quickly hauled over the 455 meters to O S A Lake.This lake is one off my favorite lakes to photograph.Launching into the turquoise blue waters,the sun fading,we made our way to the West end of the lake.Arriving at our last portage we made haste to make it over to Muriel Lake.This portage was 595 meters.By this time it was now dark.There was enough light to make our way to the West end of the lake.There are two campsites at this location.We chatted with one of the campers who told us were the campsite was. We arrived at the general location of this campsite and proceeded to search for it on shore with flashlights.My son-in-law located it and we unloaded and got the tent setup.The mosquitoes are bad here once the sun goes down.I was tired so off to bed I went. The above photo was a panoramic that I took the following evening.At the time it was hot and muggy.As I strolled along a path behind our campsite I came across this beautiful,serene scene.This would make a different take on what I usually photograph.I set the Canon 7d to take multiple exposures at different shutter speeds.With The camera set at vertical I proceeded to do six shots to cover the whole scene that you see above. 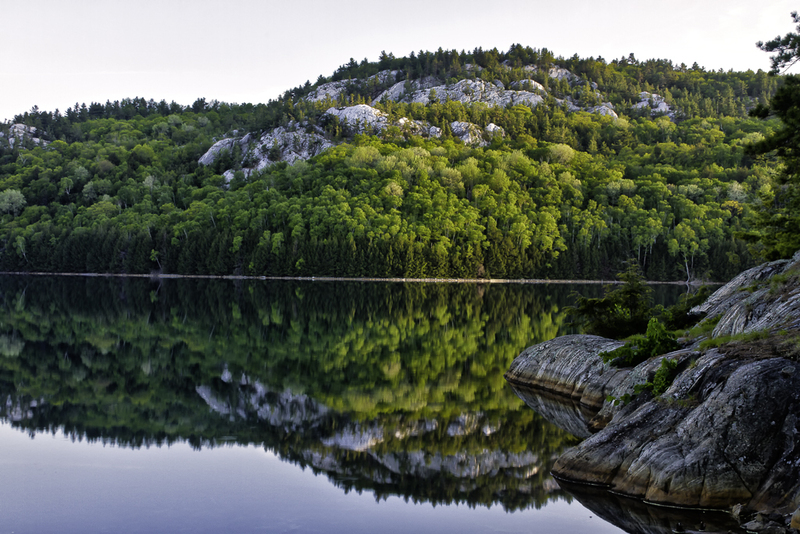 When I got home I processed each set of exposures in HDR.Then I did a photo-merge in Photoshop to create the 20″x60″ photo.I did not do any processing in HDR.This is a great way to bring out the shadow details.With the La Cloche Mountains in the background and reflecting into any open water,the various shades of green and grey deadheads over the swampy area added up to an interesting shot. Well that is it for now.I will continue the story at another date.So until next time happy trails. Wednesday morning,clear blue sky and warm temperatures.I pulled into Paul Smith’s yard.Having loaded Paul’s gear in we were soon on the road.We stopped in Lively for gas and a Tim Horton‘s coffee and were soon driving down Hwy 69 to Killarney Provincial Park. I pulled into the parking lot at the main entrance to the Park.Entering the Park office we were met by Kris Puhvel executive director for Friends of Killarney.We had a brief chat with Kris,then obtaining our camp permits we headed out.We were informed that there was a fire ban in effect. We quickly loaded our gear into the canoe and were on our way to the East end of George Lake.As we approached the portage into Freeland Lake a yearling black bear was sitting on the shore among the grass observing us,minding his own business.Unloading the canoe we proceeded to carry our gear over the short portage.As I was walking a good size water snake crossed in front of me into the water. On my return trip I spotted a male Hummingbird on the ground.I placed the colorful little fella in the palm of my hand and looking him over did not see any damage and he was alive.I then placed him in the shade of a tree while Paul sprinkled water around him.We launched our canoe into Freeland Lake were we discovered our friend the young black bear was now rambling along the shoreline looking for food. The portage over to Killarney Lake was soon accomplished.Here we met a young couple coming out.There were a few mosquitoes here to annoy you.But we soon left them behind as we made our way into beautiful Killarney Lake.The wind was light and before you know it we were at the O S A Lake portage.Here we were met by a pair of Canada Geese with six little goslings standing on shore. The geese entered the water as we pulled in and soon disappeared up the shoreline. The portage into OSA Lake is one of my favorites with its open stands of large Maple trees.The sun filtering down from above through the forage to dapple the forest floor.Here you can spot tracks of whitetail deer and enjoy the wild flowers such as Johnny Jump ups.Reloading the canoe Paul and I paddled West on OSA Lake to a campsite on a large island.Before long our campsite was in place and we sat down to relax and enjoy the surroundings.Exploring the island we discovered a number of possible compositions.With luck the wind would calm down and we could do some photographing. That evening our wishes came true and I captured the above scene.Early Spring the deciduous leaves are a nice yellow green in color.With the darker evergreen colors along with warm light you can achieve some very nice effects.The above composition is a result of this.The rock point in the foreground adds color and depth.The bit of forage on the rocks added to the scene as well.The reflections add a nice filler to tie everything in. Well that is it for this week.I have not had time to read everyone’s blog so I apologize for that as I am very busy.So until next time happy trails.